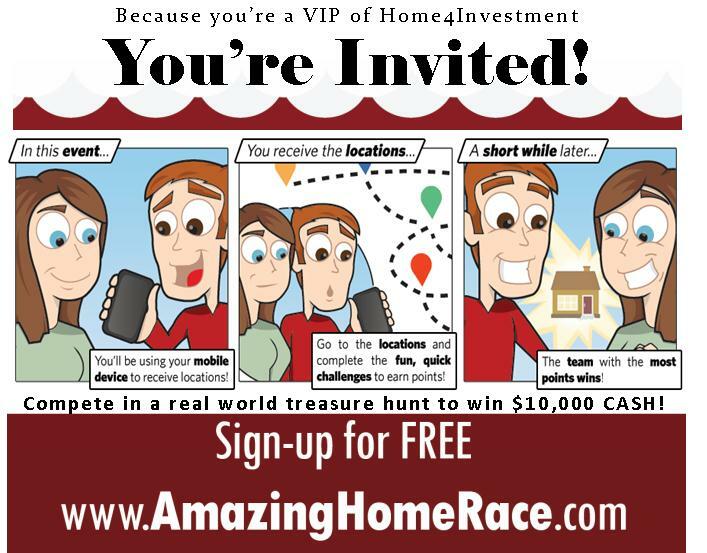 I wanted to invite you to a FREE client, friend, and family appreciation event the Home4investment Real Estate Team is having on September 10th called The Amazing Home Race. This is no ordinary event, at the end of this exciting scavenger hunt across Bellingham, someone will be walking away with $10,000 cash and many others will walk away with amazing door prizes like IPADS! Check out the official invitation I have included or just sign up at: www.bellinghamamazinghomerace.com, Also if you know of any friends or family who would be interested in participating please have them register ASAP on the website! Looking forward to seeing you on September 10th! Call or email me if you have any questions.